I found a new scrapbook store yesterday in Warsaw which had this snowman paper. I thought it was perfect to use with my snowman stamp, so of course I just had to buy it. 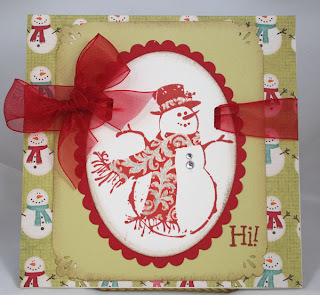 I stamped the snowman and then cut and embossed it with my Oval Nesties and cut and embossed a red mat with the Oval Scalloped Small Nestie. I decided the red stamped snowman was enough color, so I just used my sparkle pen to go over the white spaces in the scarf. Fiscars corner decorator punch was used on this olive green paper after distressing the edges with my Ink Blender Tool. SU ribbon punch was perfect for running the ribbon through the slots and tying a bow. Two clear crystals were attached for buttons, adding just the amount of bling my snowman needed. All layers of paper were glued to a 5 1/2 top folding card. I was totally done with the card and decided to Stamp the word HI on it. I failed to wipe off my clear acyclic block and I got red ink on my snow man. I was so mad at myself. Have you ever done this? I tried to correct it with some dazzling sparkles and then the ink ran. Nothing for me to do but start over. I wish there was a ink remover that could be used to correct mistakes...anyone know of any??? Thank goodness for my Un Du which removes adhesive for things that are glued down. Do you all know about it? It is fabulous! I am finding many local scrapbook stores carry it. I even have it in my little shop.